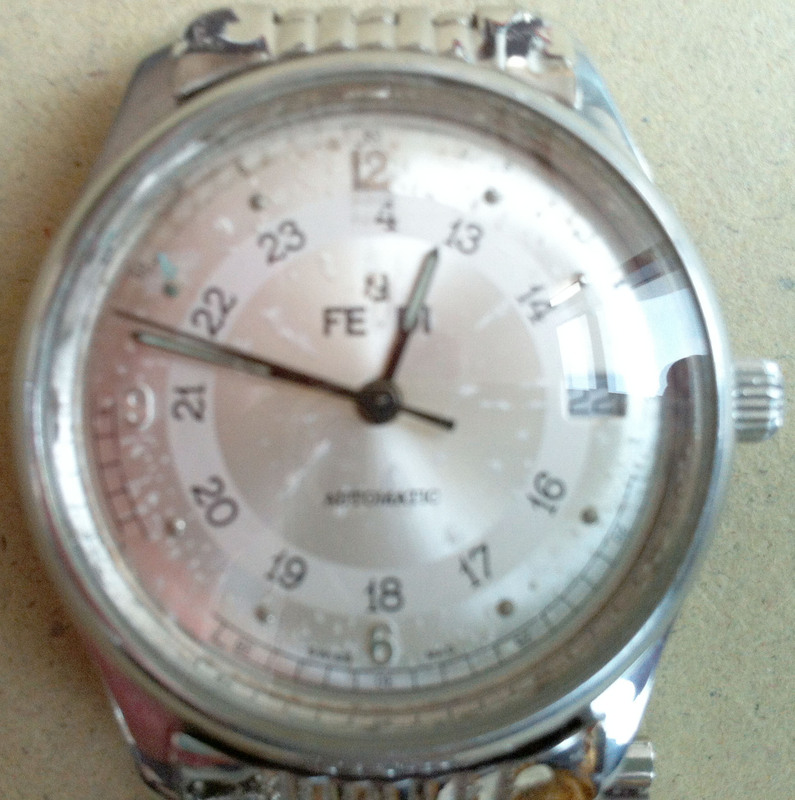 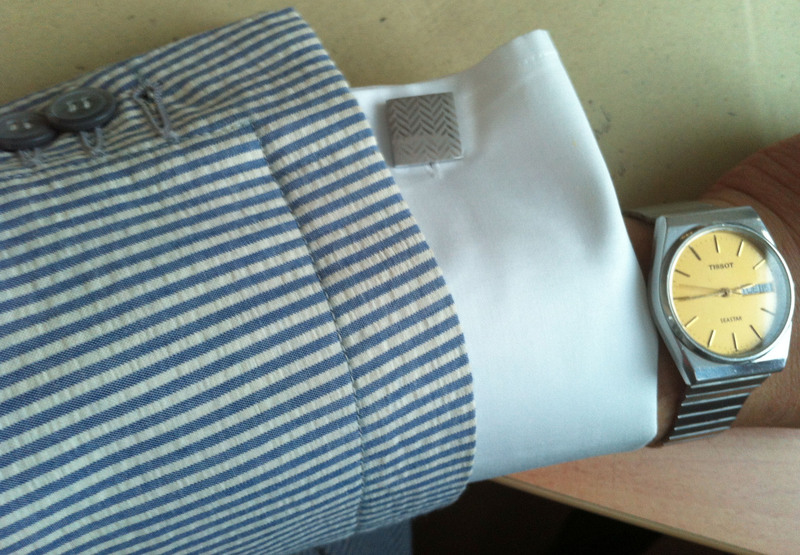 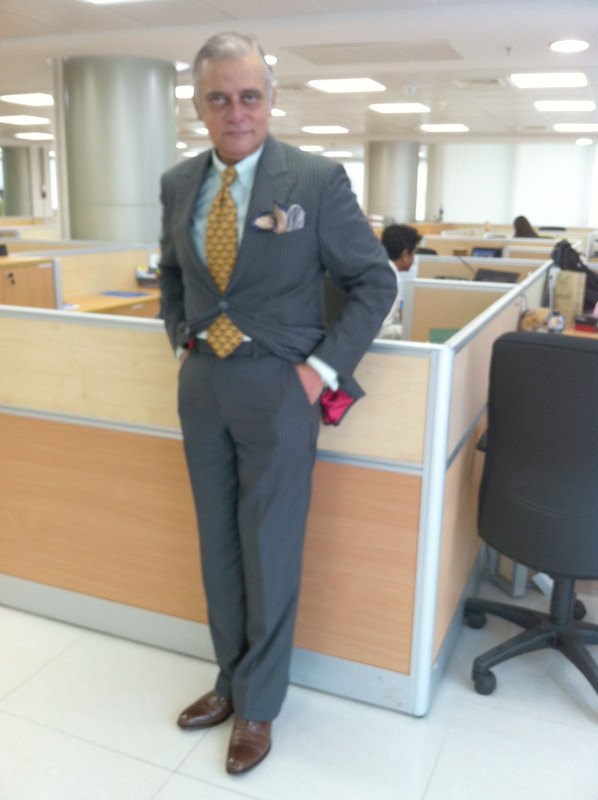 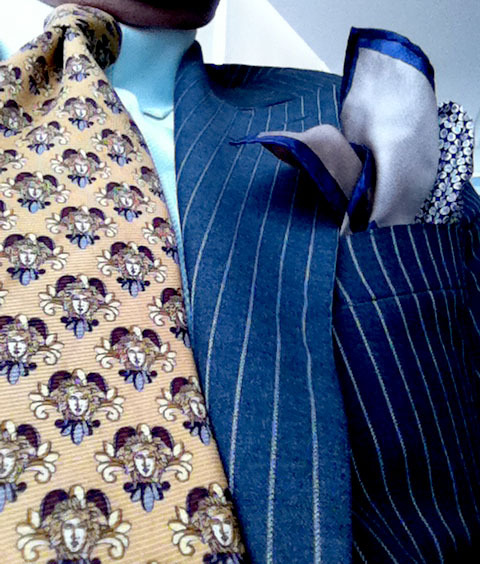 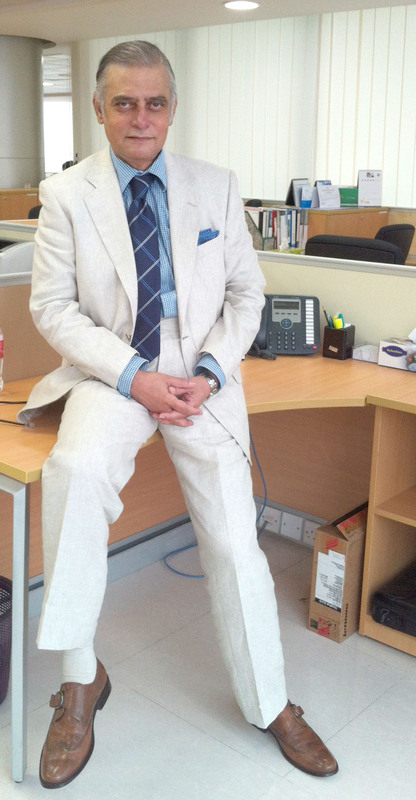 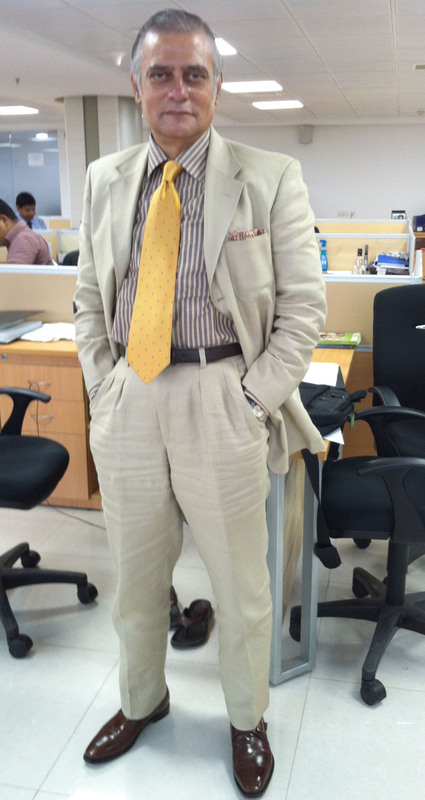 Today I am wearing a two-button, peaked-lapel, gray chalk stripe suit; a light bluish green tabbed collar shirt with french cuffs; a yellow-brown colored printed tie; a brown/navy patterned pocket square; a pair of brown cap-toed oxford shoes; and a vintage Fendi Stainless Steel Automatic Date Watch. 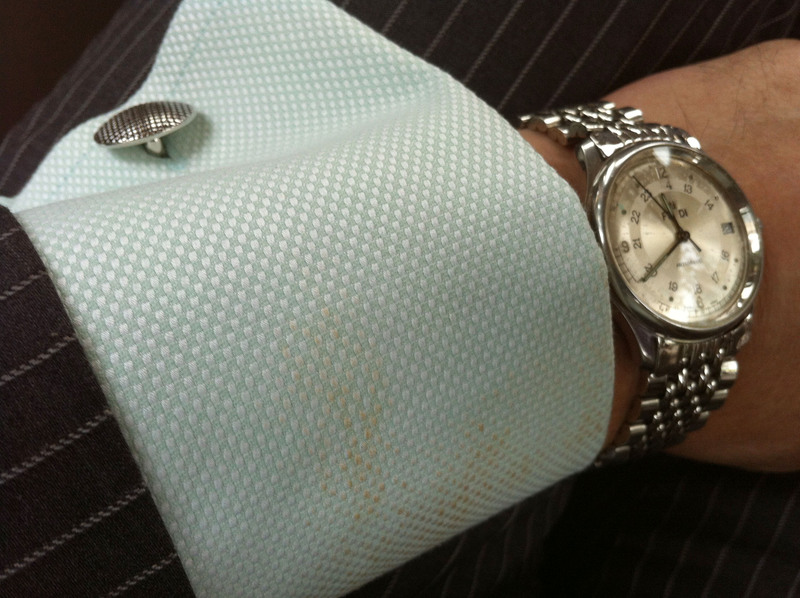 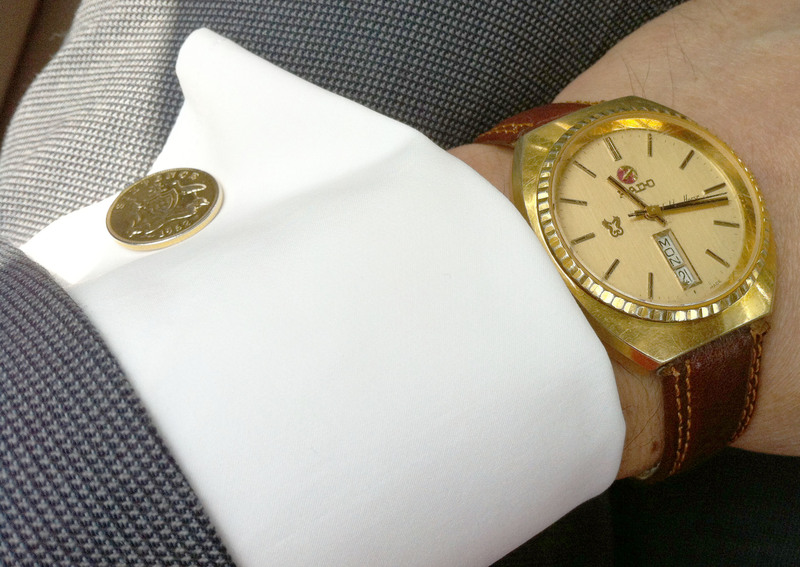 Today I am wearing a bluish gray double-breasted, six-button, suit; a white, tabbed collar shirt with french-cuffs; a solid red silk tie; a white linen pocket square, a pair of dark brown whole-cut oxford shoes; and a vintage gold plated Rado “Double Horse” automatic, day/date watch in a leather strap. 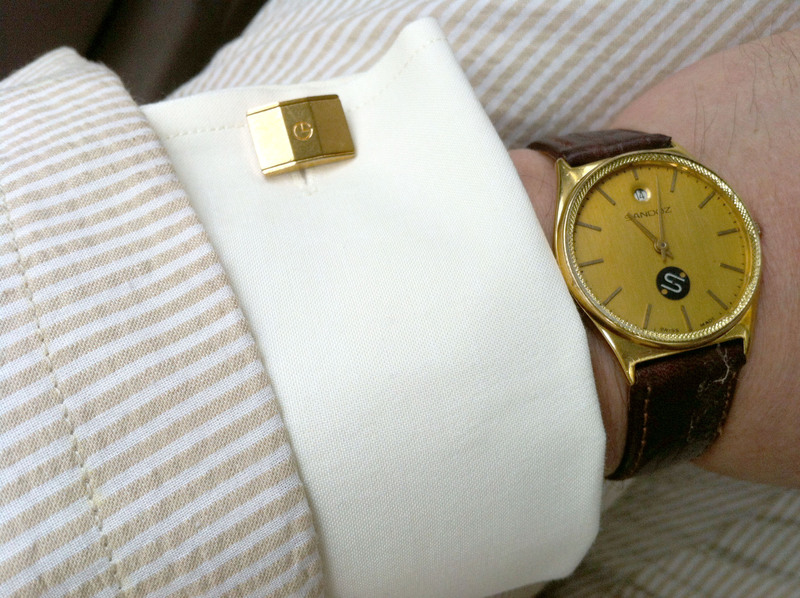 Today I am wearing a wheat colored, 3-button, notch-lapel linen suit; a hand loom cotton shirt in a kind of brown stripe with barrel cuffs; a yellow silk tie with tiny gray patterns; c printed cotton pocket square; a pair of dark brown monk shoes; and a very rare 1962 vintage Camy 25 Jewels Superautomatic Sputnik wristwatch. 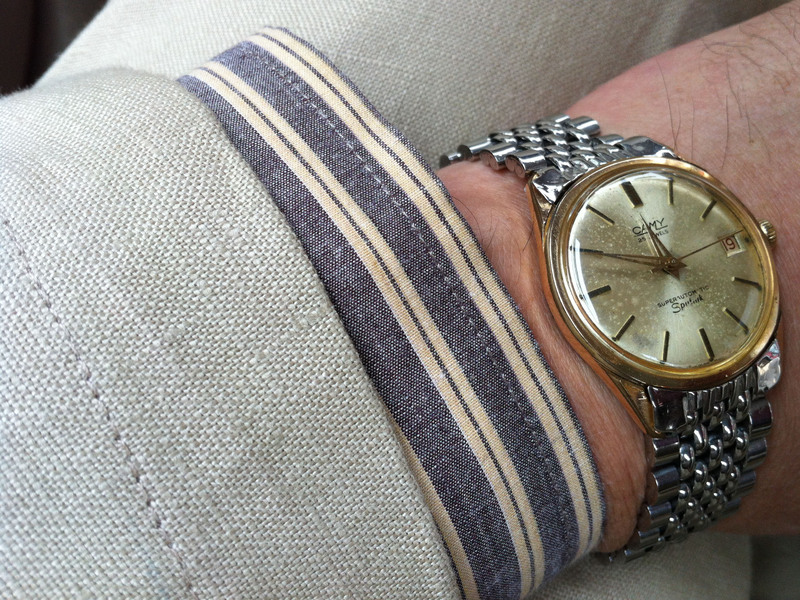 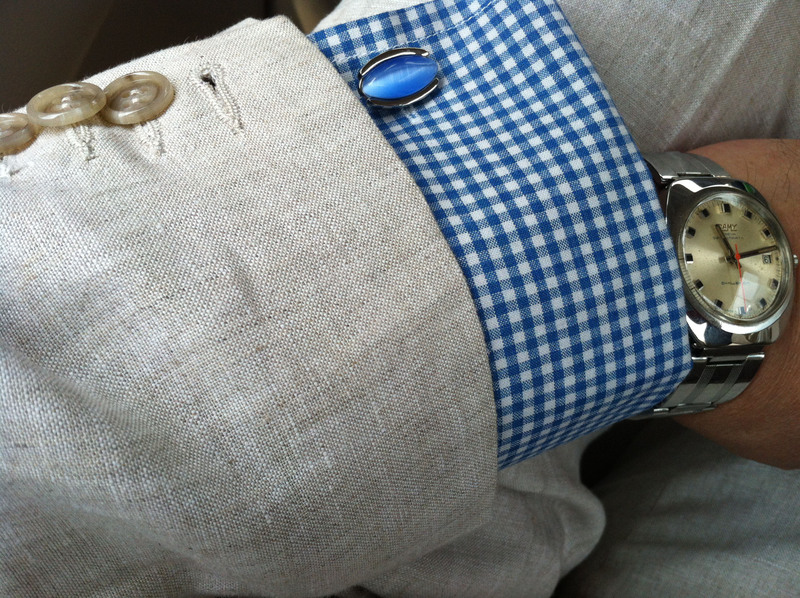 Today, I am wearing a 2-button, notch-lapel, light tan colored suit with a ticket poclet; a blue/white hand loom cotton gingham shirt, a wide check blue silk tie; a pair of light brown monk shoes; and a 1970 vintage Camy Superautomatic Challenger watch. 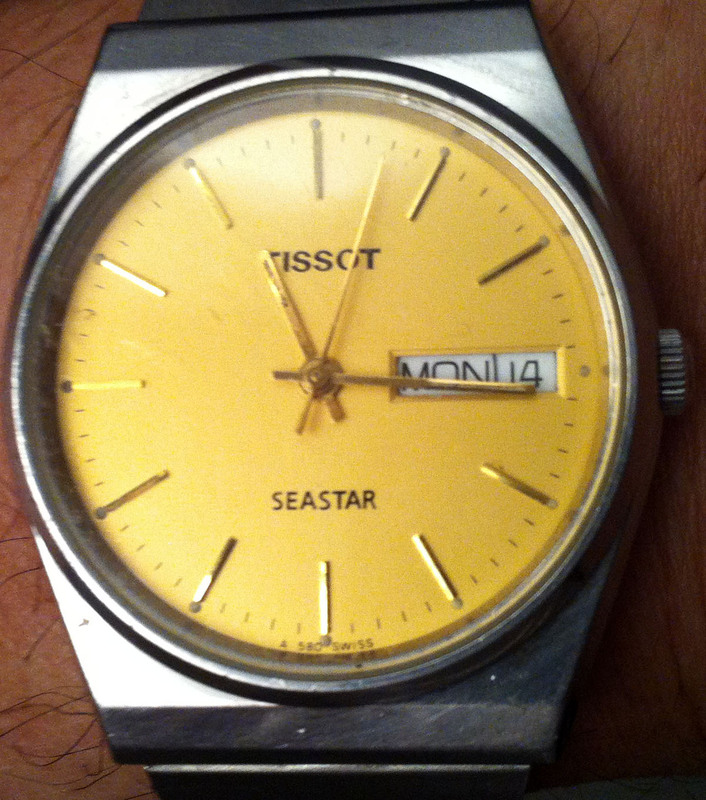 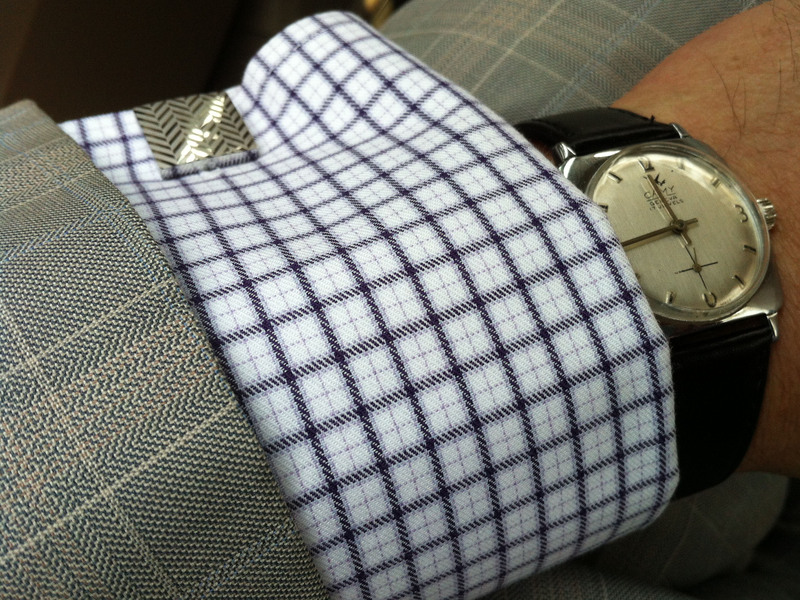 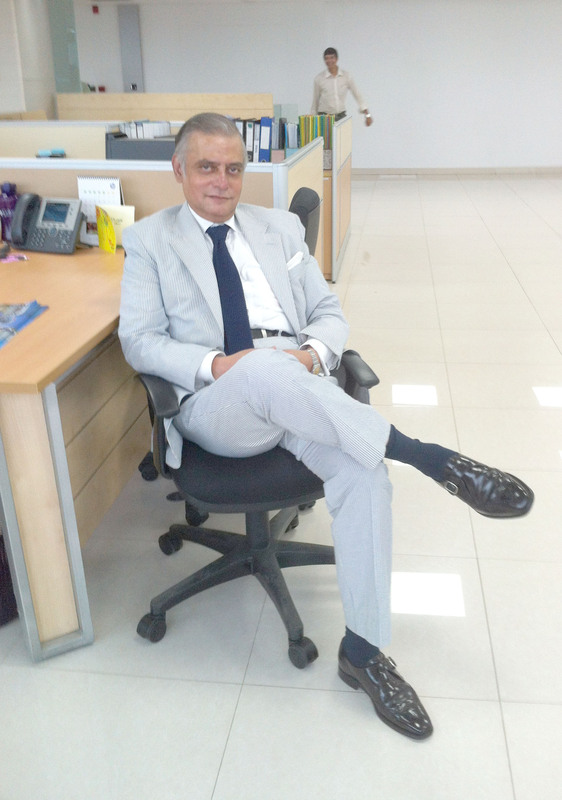 Today I am wearing a two-button, notch-lapel, blue/white seersucker suit; a white shirt with french-cuffs; a blue silk knit tie; a white linen pocket square; a pair of black brogue monks, and a stainless steel Tissot Seastar automatic watch. 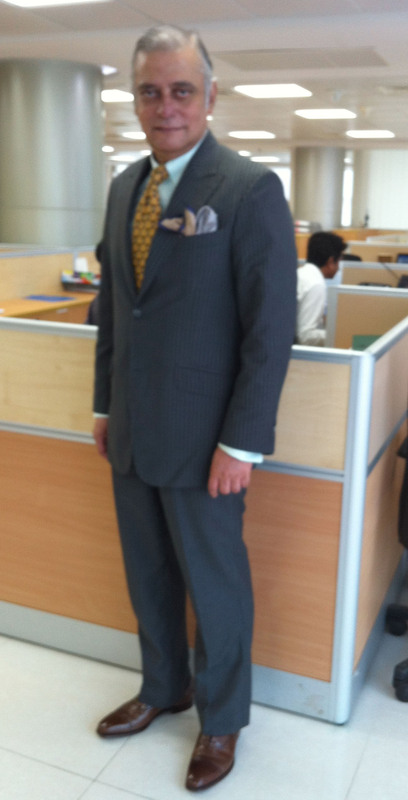 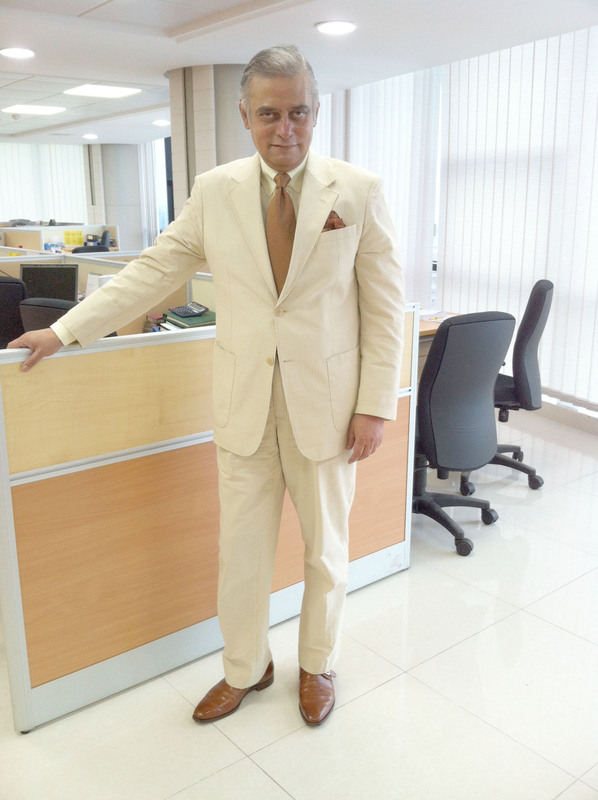 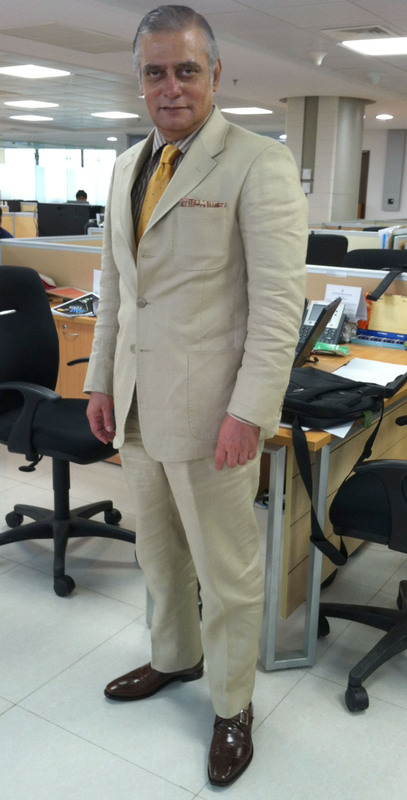 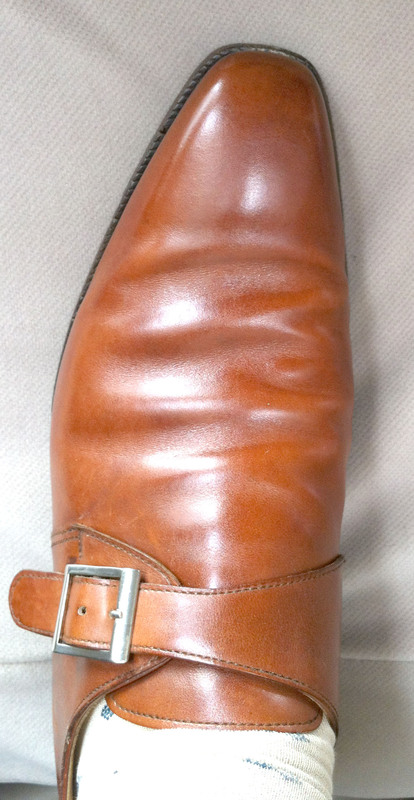 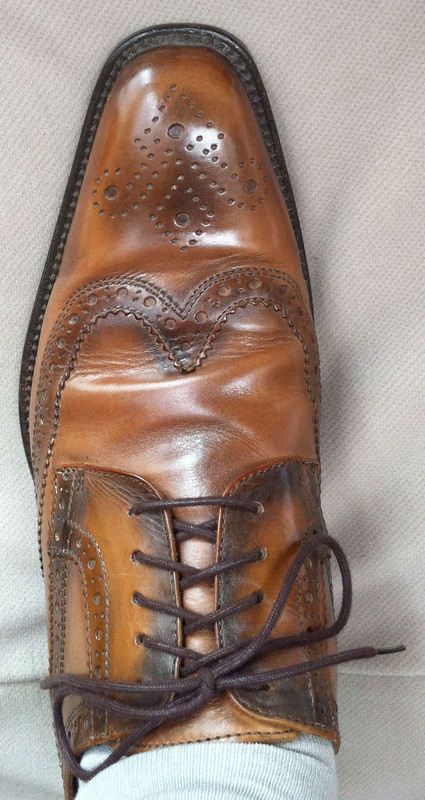 Today’s I am wearing a light brown, 2-button, notch-lapel, half-lined, seersucker suit, a lemon colored shirt with tabbed-collars and french-cuffs, a bronze tie with small patterns, a brown silk tie-dye pocket square, a pair of light brown monk shoes, and finally, a gold-plated Sandoz manual winding, circular-shaped watch. 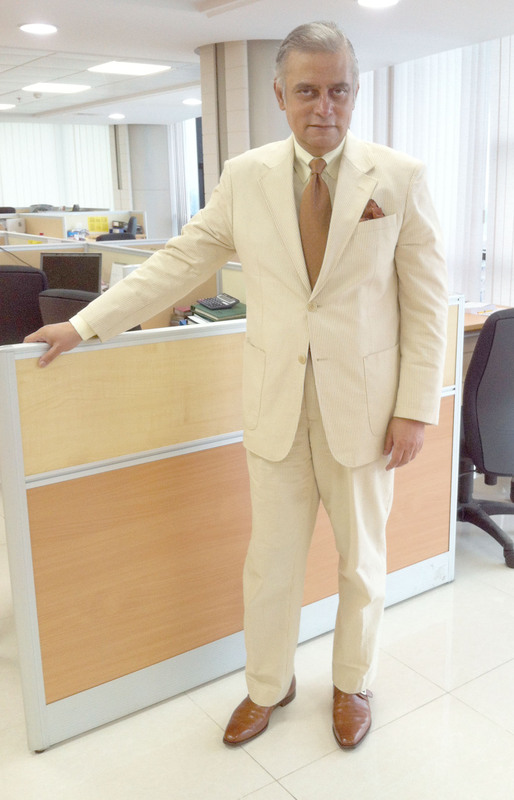 Today is Sunday, the beginning of the week here in Dhaka, Bangladesh. 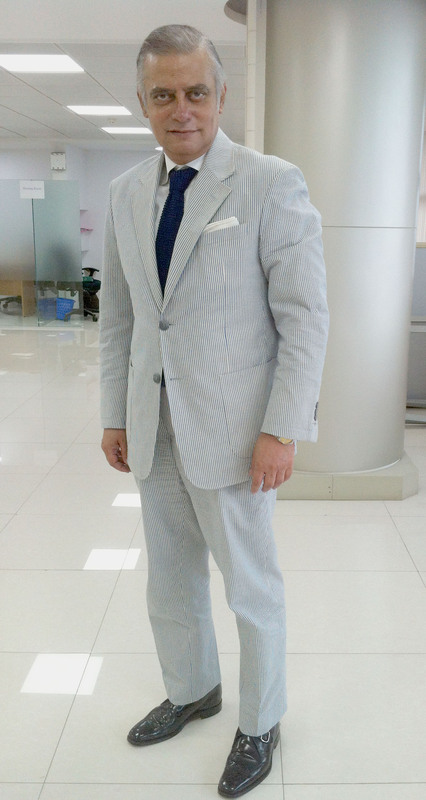 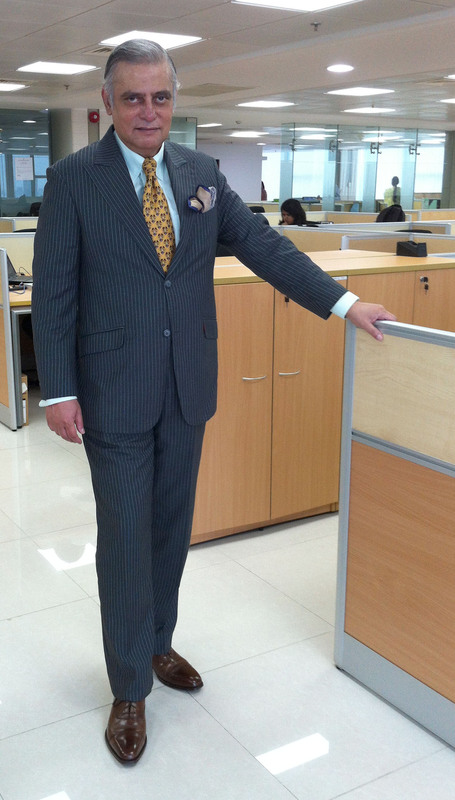 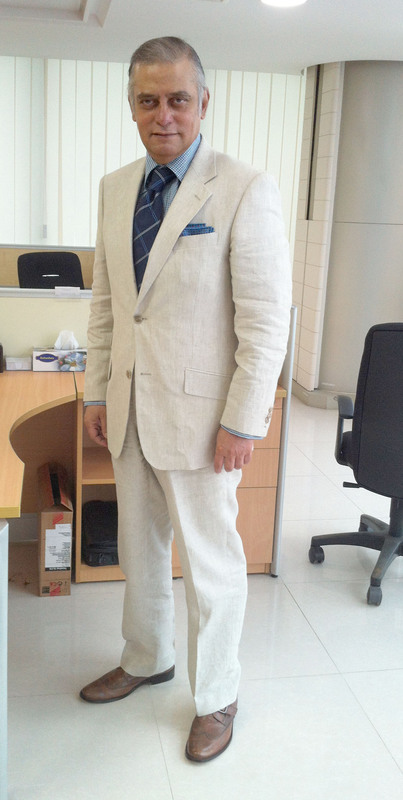 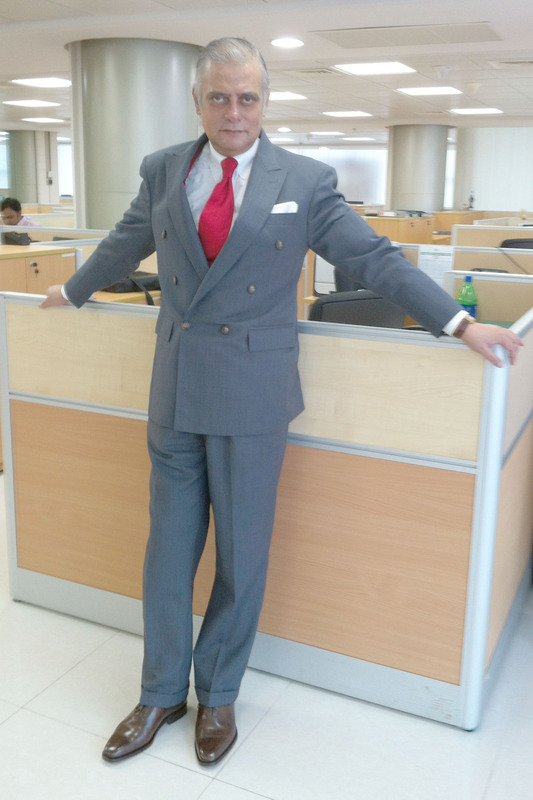 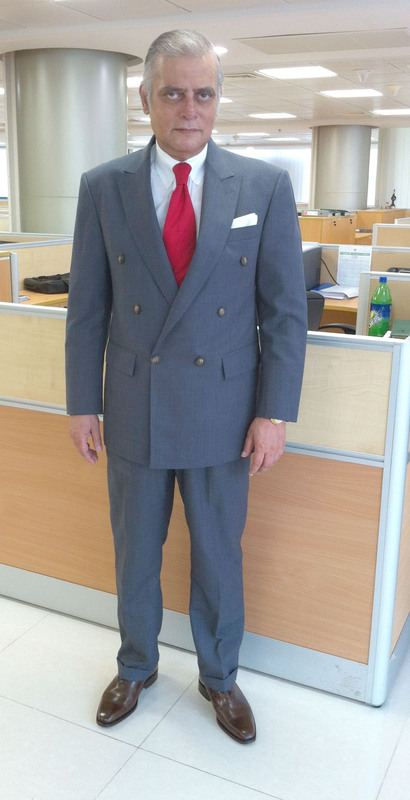 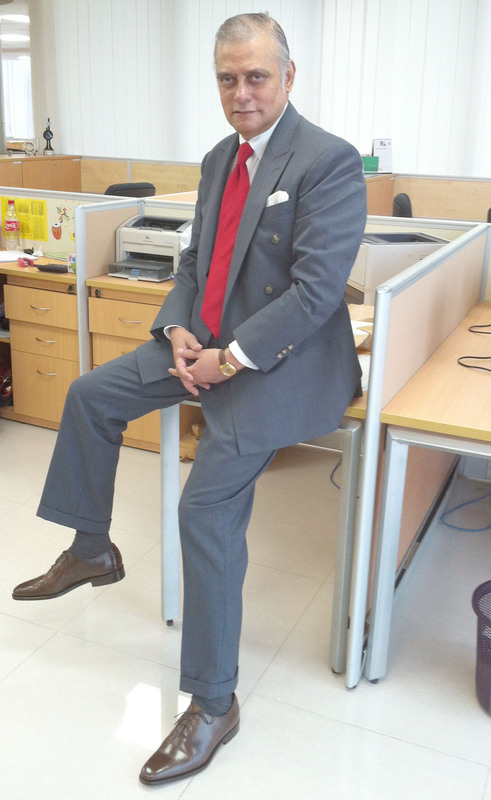 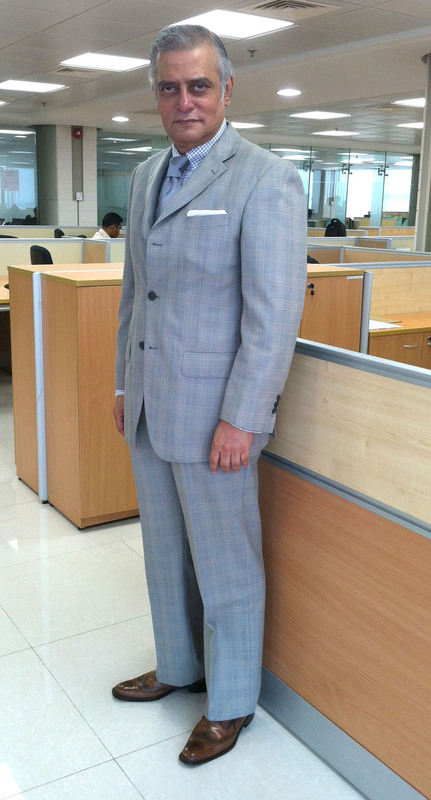 Today, I decided to go with a monochromatic look and I am wearing a light gray glen plaid, three-button, notch-lapel suit; a graph check in blue over white shirt with tabbed collars and french-cuffs; a light gray over gray wide-striped tie; a white linen pocket square; and a pair of light brown derby brogue shoes. 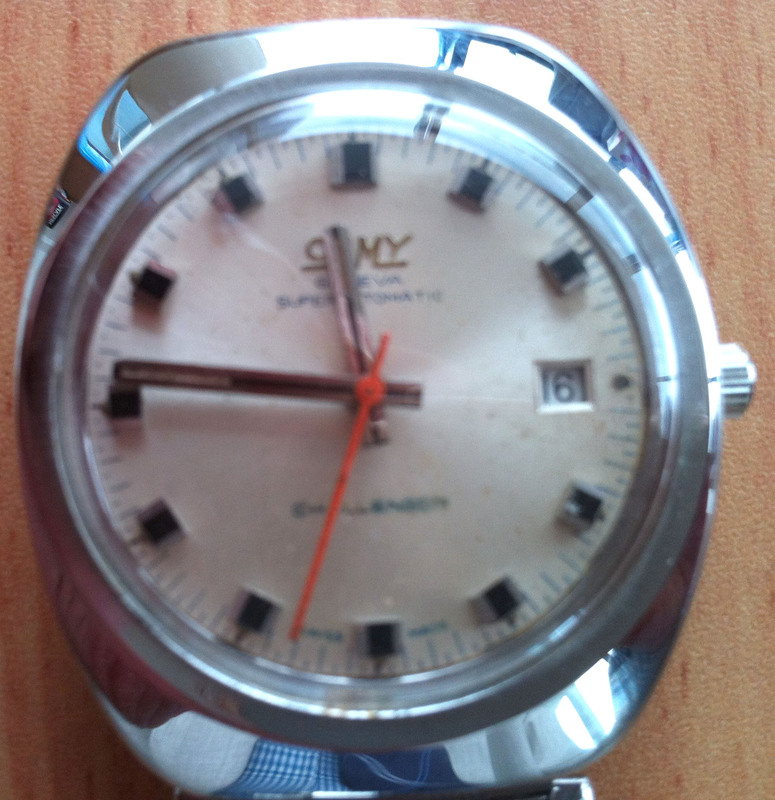 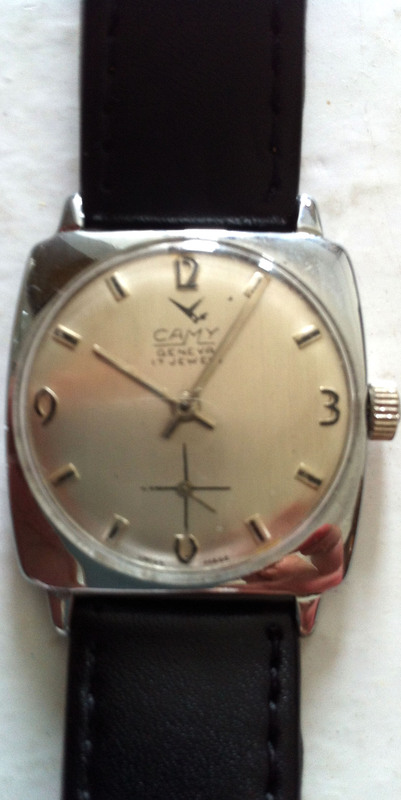 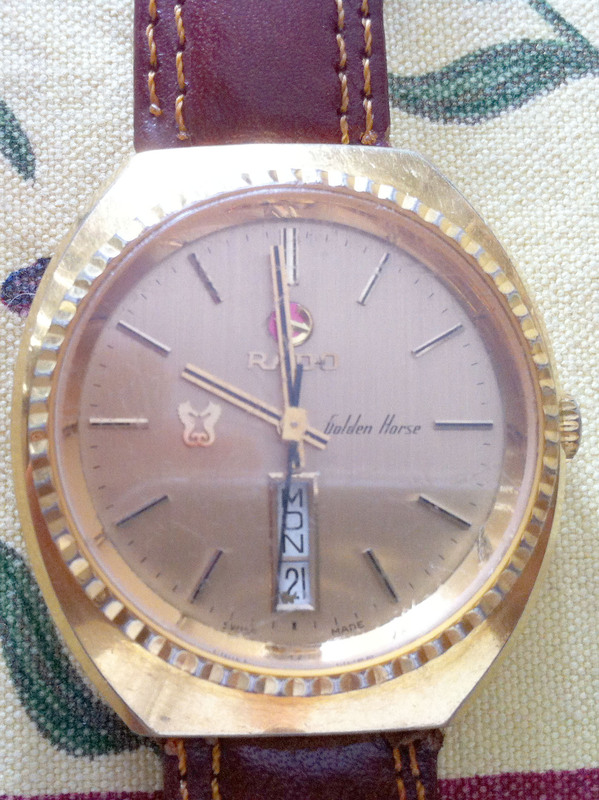 The watch I am wearing today is a vintage 1962 Camy Geneva 17 Jewels, manual winding, cushion shaped one. 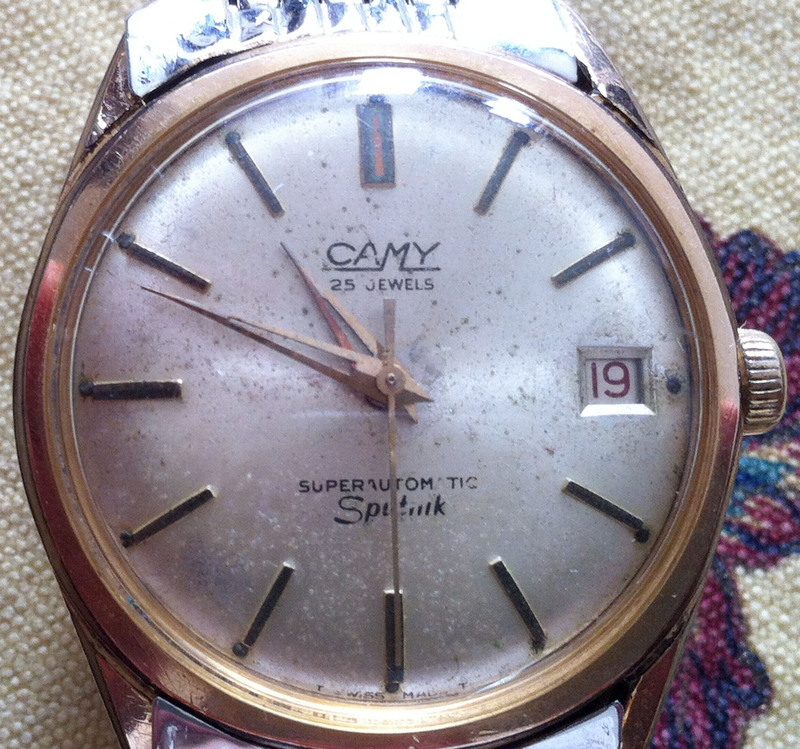 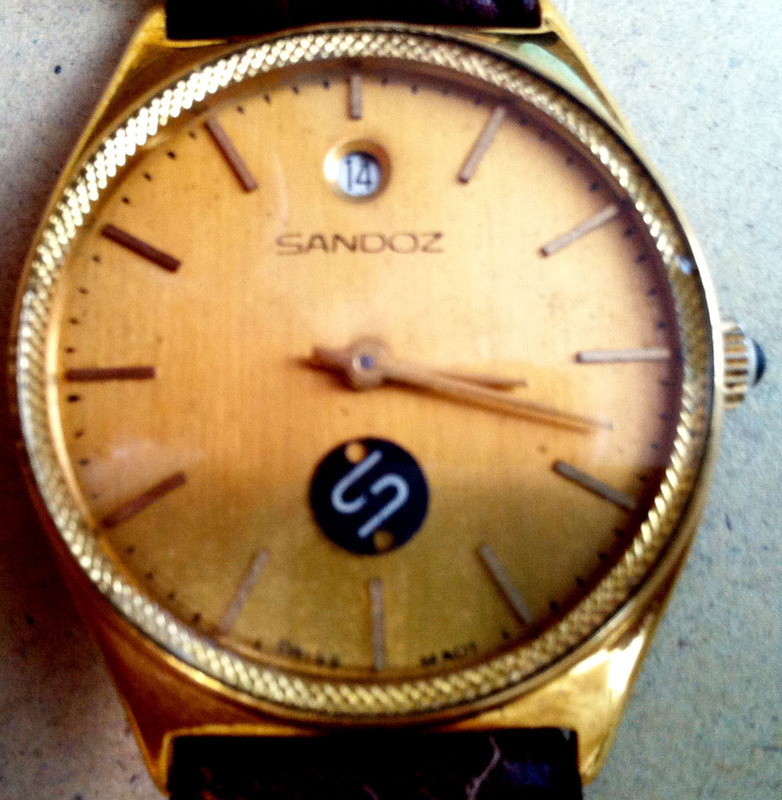 I find the watch’s tiny “second” hand located just over the “6” mark very pretty.